Sweet vibes meet gospel (Thea), the vibes drive hard (Unicycle Man), the vibes breathe deeply (Take a Moment), and the vibes lead us through a puzzle (Conundrum) on a journey home (Hometown). 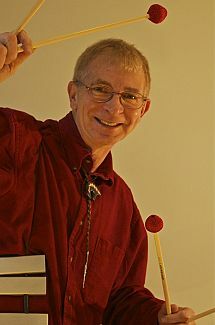 Ted Piltzecker plays Musser vibraphones exclusively and uses mallets by Mike Balter. I confess. Vibraphone is not one of my favorite instruments. My list of those I enjoy listening to at length is very short, but I must add to that list Ted Piltzecker. He is not only a technically-capable vibist, but has fresh arranging and compositional ideas. He has here a wonderful product in this CD (Unicycle Man). Piltzecker has assembled a superior supporting cast. Bob Mintzer, on tenor and soprano saxophones, who has proved himself a superlative arranger/composer, is one of the best of the New York crop of tenor players. Harvie Swartz (bass) and Dave Meade (drums) support and solo excellently. But who provides as extra-good foundation for most of the music on this CD, and pushes it into a higher dimension, is pianist James Williams. On the one piece where he does not play, although everyone’s performances are good, he is missed. As far as I’m concerned, performance-wise, Williams is the unsung star of the recording. Joe Passaro is mentioned (as extra percussion) in small print in the side credits. If he is playing all of the percussion parts (they could have been done by drummer Dave Meade as overdubs), he deserves a good measure of credit. On the selections that include percussion, this is a main ingredient, and is excellently performed, with great style and feeling. The recording sound is exceptionally noteworthy. Though the performances are wonderful, it is the arrangements and compositions which are the most outstanding elements on this project. I especially admire the introductions. All are originals by Piltzecker except No Greater Love, which was placed next to the last on the CD. The liner notes are good brief observations by the leader about each selection, (except for the last track) but I would like to know something about Piltzecker himself. Each selection of the CD is quite unique and deserves individual mention, and I have five favorites out of the nine tracks. The first is an ideal opening number, Buffalo Dance, a medium-up Latin salsa. It is eased into with percussion, the tenor saxophone melody threading in over a rhythm pattern. Vibes and piano play the release section. which leads into the solos. Mintzer’s tenor sounds relaxed and hip, his solo has good structure with some interesting cross rhythms. Throughout the album, Piltzecker’s vibes sound especially good: excellent microphone placement and pickup. The interlude features a cross rhythm clapping pattern which leads to more tenor improvisation and then back to the head. A word about Mintzer: he almost always solos with interesting content, but when the rhythm section settles into a funk groove for a length of time, he sometimes gets sucked into playing clichés. The second favorite of mine is Thea. For what started as a sweet waltz written for Piltzecker’s daughter, this tune turns out to be, for me, the Pièce de résistance of the album, thanks to James Williams. Piltzecker’s liner notes state: “During the session we recorded it as a sweet little waltz, just as intended. When the band went into the booth to listen to the take, I noticed that James Williams was still at the piano, and still messing with the tune. James is from the South, and has a deep-rooted gospel background. When I heard what he was doing I thought ‘Yeah!’ and forgot about waltz idea. We immediately went back in and recorded this version.” Williams’ comping is a delight, subtly accommodating and working in a few of the original more dense chords betwixt his gospel interpretations. Even beneath Swartz’ excellent bass solo, Williams continues his full, but soft gospel style. Another that vies for my very favorite is the closing Hometown. This is the tune about which I would have most enjoyed some comment on the liner. It is an appealing melody on a Latin bossa groove. Again, the percussion playing is important and outstanding. One bothersome element, is the uncharacteristic use of synthesizer (string sound) chords on the intro. A choice section of this piece has the entire band playing a single chord in a jutting rhythm that builds in intensity, underpinning a fine Dave Meade drum solo. The most unique composition is Conundrum, another straight eighth bossa. Again we hear an inventive introduction setting up the melodic statements that are contained in several sections, at the end of which is a short, odd-metered interlude. The title tune, Unicycle Man, is a clever piece which relates to Piltzecker’s philosophy regarding his art. He has been riding a unicycle for almost thirty years. There’s a great photo on the CD cover of him riding. In the liner notes he writes. “Balancing is a series of corrections. It is an interesting place to be."